Although the sugarcane aphid (Melanaphis sacchari) was not a serious problem in Texas, Kansas, or other states in 2017; its occurrence in Kentucky appears to be problematic due to the high numbers being observed in sweet and forage sorghum in Fayette, Logan, Lyon, and Caldwell counties during the last part of July and August in 2017. Recent tallies in Fayette (Bessin personal observation), Logan, Trigg, and Lyon counties (Villanueva personal observation/communication) show that averages are above threshold levels (an average of greater than 30 sugarcane aphids per leaf after sampling 40 leaves from four different sites in a field; or greater than 30% of plants infested with aphids at flowering or milk). During these visits, Dr. Villanueva noticed colonies well established and leaves looking shiny or glossy due to the accumulation of honeydew (excretion of aphids). Figure 1. Sugarcane aphid can be recognized by its yellow color and black tips to its antennae, cornicles (‘tailpipes’), and tarsi (‘feet’). Using a hand lens these species can be easily identified. This year, we have received reports from county Extension agents and farmers about the presence of aphids on fields of corn and sorghum. However, some of these aphids were observed on the whorl of these plants. Based on graphic images and visits to fields, Dr. Villanueva observed that most of the aphids were corn leaf aphid that usually does not require insecticide applications. The difference between corn leaf aphid and the sugarcane aphid can be observed in Figure 2. 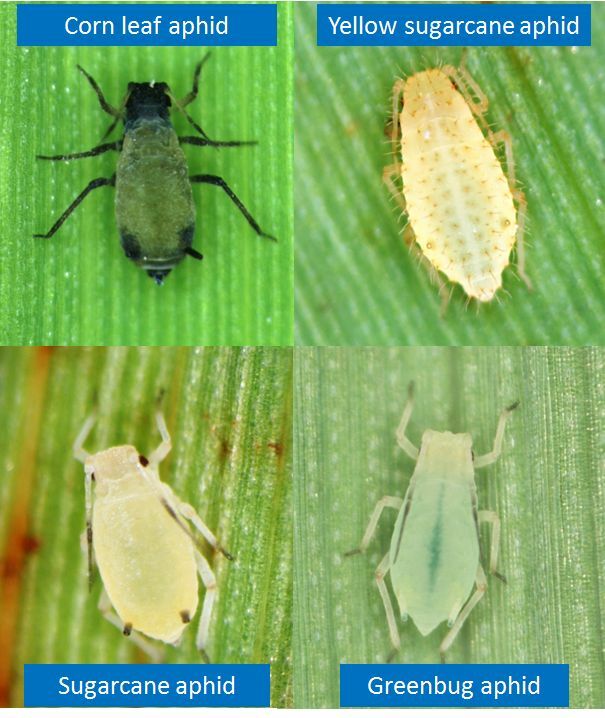 As mentioned above, corn leaf aphids are abundant in whorls of corn or sorghum and are grayish-green, while sugarcane aphids are found feeding in the lower leaves. Sugarcane aphid feeds on sorghum, and so far, they are not known to feed on corn. Figure 2. 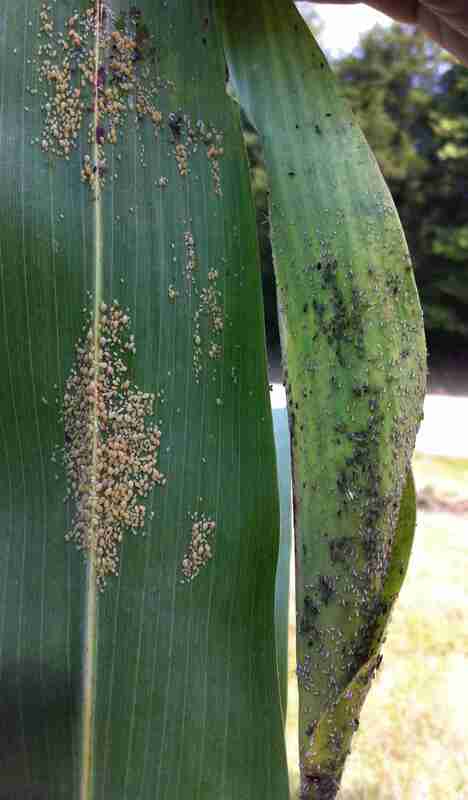 Sugarcane aphids in the lower surface of a leaf (left side), and the corn leaf aphid in the whorl of sorghum (right side). Grain, forage, and sweet sorghum producers are advised to scout their fields by examining the undersides of leaves for sugarcane aphid on a weekly basis. At a minimum, producers should examine at least 40 leaves in small-acreage fields. The action threshold for treatment we are using was derived from grain sorghum in Texas and is approximately an average of 30 aphids per leaf. Sugarcane aphid has the ability to increase in number very quickly, so if they are detected in a field but are below threshold, the field should be rechecked in a few days. Two insecticides are available to control sugarcane aphid: on grain and forage sorghum, Sivanto prime (flupyradifurone) and Transform WG (sulfoxaflor); for sweet sorghum, only Sivanto prime is registered in Kentucky. This year to meet EPA requirements for reporting, we need applicators to notify David Wayne through e-mail (David.Wayne@ky.gov) at the KDA with acreage treated and amount of Sivanto Prime used in sweet sorghum and Transform in grain and forage sorgum. This will help to ensure we are eligible for future EPA exemptions. The EPA granted a specific exemption for Sivanto Prime use against sugarcane aphid on sweet sorghum in Kentucky in June and the Section 18 label is available through county Extension offices. The exemption lasts until November 15 of this year and allows up to four foliar applications, with a rate of 4 to 10.5 fluid ounces per acre, and a maximum seasonal use of 28 fluid ounces per acre. There is a 21-day pre-harvest interval. Applicators must be in possession of the Section 18 labeling for Kentucky and be certified applicators. There is a 14-day minimum interval between applications. There is a 7-day minimum interval between applications for forage or grain sorghum.